Create a mobile and fast network connection without any cables! 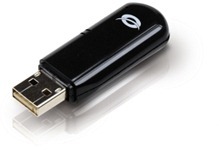 This 150N Wireless USB Adapter allows you to connect your computer or notebook to a 802.11n (max. 150Mbps), 802.11g (54Mbps) or 802.11b (11Mbps) wireless network. The connection speed of this 150N USB adapter is almost 3 times as high as a 54Mbps USB adapter. Thanks to the WPS button it is very easy to connect and secure your wireless network. Conceptronic C150RU is based on the Ralink 11n wireless LAN USB chipset.